Place the chicken in a large saucepan and seal the chicken until a golden brown colour. Pour in the stock and add the spring onions, garlic and ginger. Bring to the boil, cover and simmer for 30-35 minutes. Remove the chicken from the stock and leave to rest on a plate. Turn up the heat so that the stock starts boiling and leave to reduce for a further 10 minutes. Brush the chicken with the sesame oil and season lightly. Heat the steamed wholegrain rice in a wok and add the red chili and stir through. 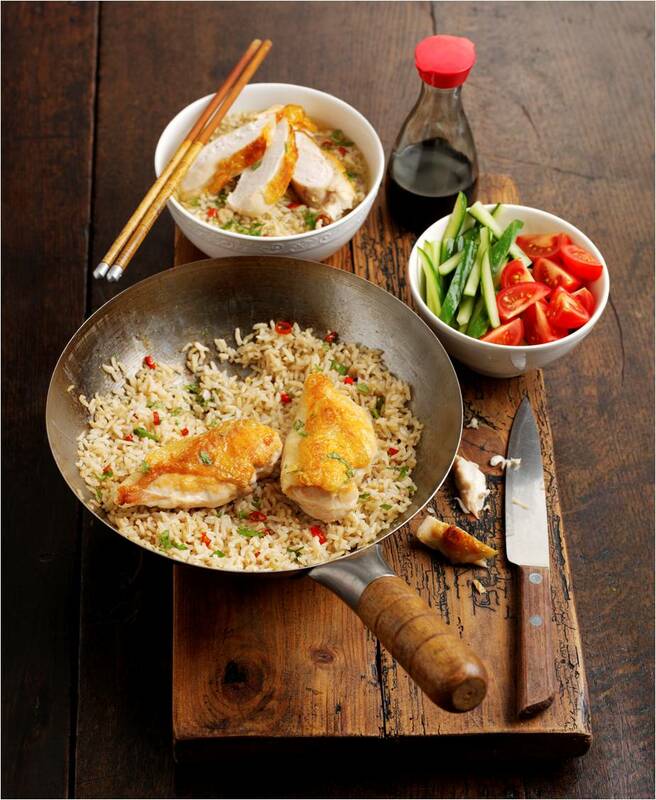 Serve the rice in bowls along with some of the stock, the chicken and the garnishes topped with soy sauce.